Durham Street, named after the historic family of Grange and the surrounding estates of Ethiebeaton, Ardownie, Omachie Pitkerro and Easter Powrie. In 1534 John Durham, second son of the seventh laird of Grange bought one third of the Pitkerro Estate from James Scrimgeour, Constable of Dundee. Alexander Durham, the third laird of Pitkerro served James V1 of Scotland and 1st of Great Britain as Silversmith & Marshal His son James Durham became James V1 & 1st`s Cashier & Clerk of the Exchequer. 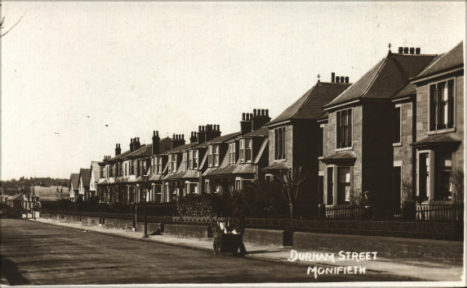 The Durham`s of Monifieth district certainly a legacy of historical interest to those who wish to read their story. The villas built in the street named in celebration of their feats were built, between the two World Wars, by and locally known as `Syndicate Houses`. Local tradesmen formed a building syndicate and made a combined effort both in labour and financial costs to erect desirable properties for sale to private individuals. The houses are a credit to their inspired business sense and excellent craftsmanship. This entry was posted in Articles and tagged Durham, Grange, Pitkerro. Bookmark the permalink.